A documentary on the three major schools of Okinawan Karate: Uechi Ryu, Goju Ryu and Shorin Ryu. Cook Ding's Kitchen 10th Anniversary! Today is the tenth anniversary of Cook Ding's Kitchen. I often get asked if this is a "foodie" blog, and who is this Cook Ding cat anyway? (Having finished his operation), the cook laid down his knife, and replied to the remark, 'What your servant loves is the method of the Dao, something in advance of any art. When I first began to cut up an ox, I saw nothing but the (entire) carcass. After three years I ceased to see it as a whole. Now I deal with it in a spirit-like manner, and do not look at it with my eyes. 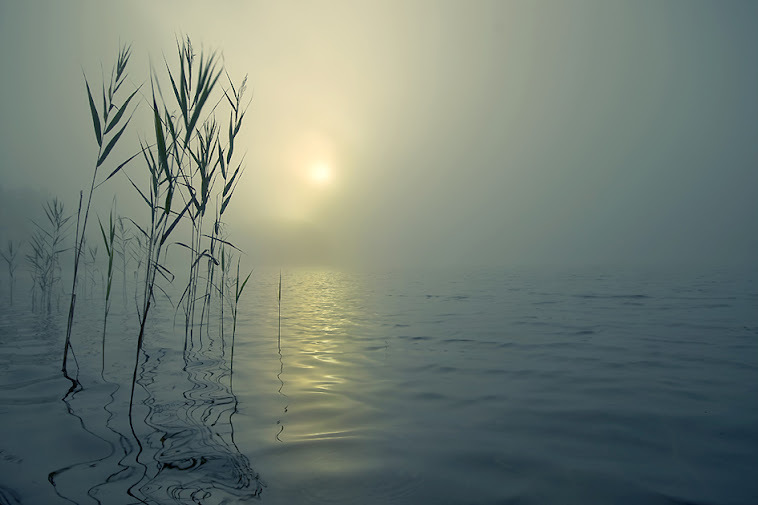 The use of my senses is discarded, and my spirit acts as it wills. Observing the natural lines, (my knife) slips through the great crevices and slides through the great cavities, taking advantage of the facilities thus presented. My art avoids the membranous ligatures, and much more the great bones. A good cook changes his knife every year; (it may have been injured) in cutting - an ordinary cook changes his every month - (it may have been) broken. Now my knife has been in use for nineteen years; it has cut up several thousand oxen, and yet its edge is as sharp as if it had newly come from the whetstone. By going deeply into his skill, Cook Ding learned how to live life. After ten years, Cook Ding's Kitchen has has about 1500 posts, 500K hits and over 100 followers. I'd like to thank each and every one of you for visiting. Summer is shaping up and I am adapting to what is going on around me. The work related travel has begun again in earnest. I find whatever good habits and practices I've put together seem to get scrambled when I travel, but I return to the norm quickly. There is the work around my house and my place up in the Thumb of Michigan which takes up a lot of my time. This October will be the 40th year reunion for my high school graduating class. I am part of the organizing committee. 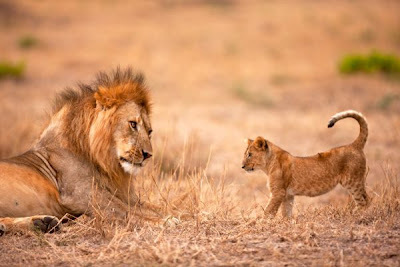 While it doesn't take up a lot of my time, the time it takes is often in conflict with other things and as you only have a 40 year reunion once, that seems to win out. I am once again running the Detroit Free Press International Half Marathon, also in October. This year I am running to raise money to fight human trafficking. My fund raising page is here. This year it is especially important for me to get in my miles, because not only am I running that half marathon in October, I am running a full marathon at Disney World in January! Additionally, I gave my wife dance lessons for her and I for Mother's Day. She hasn't taken me up on them just yet, but the offer is still hanging out there. With all of this, something has to give and sadly BJJ is taking a back seat. I am only making it to a handful of classes a month. I hope to get some private lessons in from time to time, but it's not really until autumn, after the yardwork, reunion and half marathon are out of the way that I can really start getting decent time on the mat again. What I am doing in the meantime is putting more emphasis on zhan zhuang (which is good for everything) and the five elements forms of xingyiquan. Here are a couple of videos of a Hung Gar set that was brought to my attention by the excellent blog, Kung Fu Tea. Below is an excerpt from an article that appeared in the Siberian Times (!). It's about a local aikido club that has more than it's fair share of grandmas who have been training for over 10 years. The full article may be read here. Please follow the link, you'll be glad you did. For myself, it is my goal to be the toughest guy in the nursing home one day. A unique fight club for babushkas has celebrated its 10th anniversary in Siberia. More than a dozen elderly ladies are members of the Yoshinkan Aikido group in Novosibirsk, and gather to spar and throw one another about. Formed in 2005 as a way to get the older generation thinking about their health, it is thought this is still the only group of its kind in the world. - People are more likely to do something for you if they see something in it for themselves. Other reasons are much wearker. Below is an excerpt from an article that appeared in the Huffington Post. The full article may be read here. I'm sore all over. My Achilles heel is swollen up like a golf ball. My left knee aches. My shoulders have more knots in them than a sailor can tie -- all from training intensely for my Aikido test next Saturday. It's for my first Kyu, the test before the Shodan or black best test. When I tell people that I train in Aikido (Japanese martial arts), they typically get a look of admiration in their eyes, like I'm Xena, the warrior, even when I tell them it's nothing to be impressed about. If you saw me throw a 200-pound guy you wouldNOT, I repeat NOT, be impressed. Because... I'm not flowing, graceful, relaxed, coordinated or elegant. To the contrary, I'm stiff, tense, foot-awkward and have poor timing. I still cry after many a class with frustration. Sometimes, in the middle of class, I panic, and think I can't do it. My sensei always seems to catch me when that look crosses my face, and he says, "Susan, you can do it." Or "have courage." Or "be brave." Which then triggers tears that I hold back, because it's not considered Budo, or martial, to cry on the mat, and I'll be damned if I'm going to break that man-code. The other day, I trained with a black belt after hours who hit my jo (long wooden staff) with so much force it smacked me on the side of my head so hard that I was stunned. Once I recovered my senses, I rushed to the girls' dressing room to get some ice from the freezer and felt the tears coming -- more shock than pain. But all my training helped me ground and center myself so I could just focus on the task and not the pain. After a few minutes of icing we continued to train. Why do I keep doing it? It's a case of love/hate. Yesterday my teacher, Hans Goto Sensei said we train to prepare ourselves for the unusual, to face things bravely and to see clearly. I strive to be elegant and skilled, to master not just my mind and body, but my emotions, fears and feelings. In so many ways I'm really far away from any kind of self-mastery right now. Case in point: I just did a run through for "the test" on Sunday and the two black belts I was training with said I was timid. This pains me. I'm not a timid person. I've run my own business for over 23 years and have taught thousands of people, everyone from CEOs to celebrity chefs, rock stars to reality TV contestants, entrepreneurs, authors, speakers, coaches and consultants, to speak up and not to take guff from anyone and to prepare for media interviews for Oprah, 60 Minutes, The Today Show, Howard Stern, Bill O'Reilly, NPR etc. -- tough shows with little room for error or timidity. My motto is "Speak your mind. Stand your ground. Sing your song." I live by it. Or rather, I'm living into it. But for whatever reason, I haven't been able to translate those skills that I use in business onto the mat. When I told my sweetie, Will, that I was called "timid" he said, "You're not a timid person. Timid is a character thing. You're just a little hesitant when it comes to Aikido. Hesitancy can be overcome with practice." Because I have a second motto I live by: Keep training. 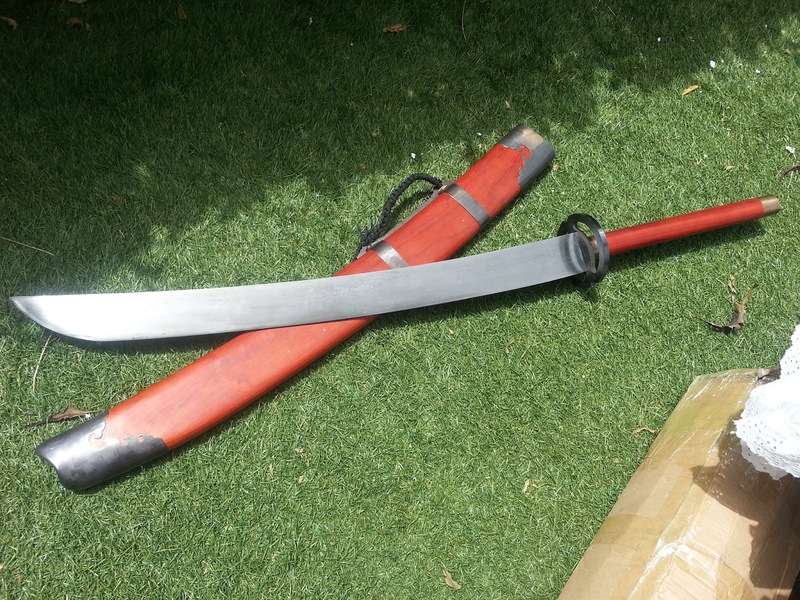 Previously Jonathan Bluestein had written about the Brilliance of the Chinese Longsword. Today he writes about the world's largest Miao Dao. Enjoy. For me, when I began training with the miao dao, that was following years of practicing spear and staff methods. The spears I use are very large, 3.5 meters long (11.5ft), quite thick and heavy. Therefore, when I took miao dao into my hands, it was not long before the weight stopped being a challenge. Averaging mere 1-2kg (2.2-4.4lbs), they are usually heavier that a katana, but are not truly ‘heavy’ as a hand-held weight. While I believe that the normal weight of the miao dao is very functional and is key for performing with good technique, I sought something that would challenge me more and provide a good resistance training quality. This was when I began seeking a swordsmith that would make me a larger miao dao. The article of you is a review of my ‘quest’ to do so. It should be understood that miao dao are already quite large by nature, bigger than katanas and certainly less wide-spread than them. 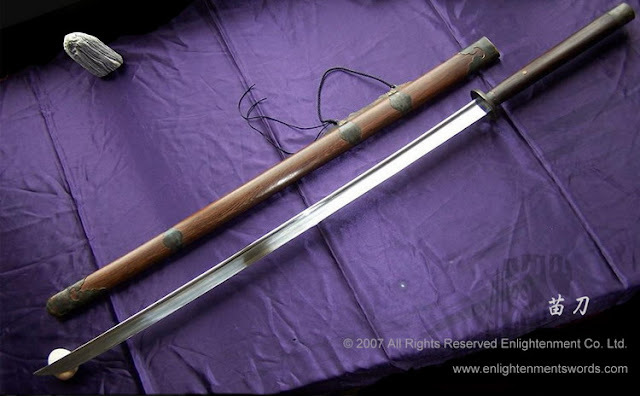 Very few smiths outside of China make miao dao, and in China too it is just not as common as other types of swords. Therefore, it was reasonably difficult to find a willing swordsmith. When I wanted my project done, I simply googled things like ‘customs swords’ or ‘custom katana’, and began doing research on various smiths and manufacturers. I must have sent emails to at least 30 of those I thought were up to par, but less than 10 actually answered my letters. Of them, the only forge that was willing to undertake the challenge fully (for a price lesser than that of a small car) was Sino-Sword. It should be noted that the Japanese company Tozando was also keen, but their smiths could not guarantee that they would be able to produce a blade over 3kg in weight. Sino-Sword are from Longquan, which is a region in China well known for its swordsmiths. 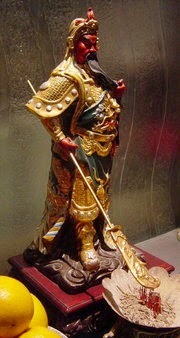 Much of the Chinese sword industry resides there. This company has been operating since 2009, and many Westerners have purchased blades from them. After much digging into Google, I managed to find over 10 reviews of their products. They seemed legit. Most customers were happy, and those who had complaints almost always received refunds or had their swords repaired as demanded. It also looked as if the quality of service and production was improving over the years (as Sino-Sword themselves indicate on their website), and I decided to give them a chance. The task at hand was daunting. 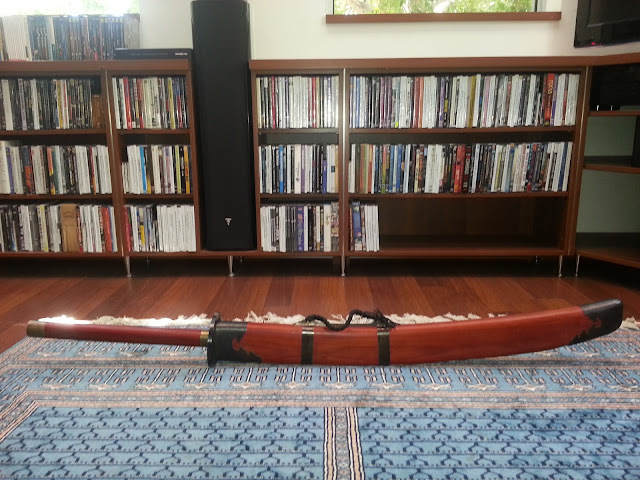 I demanded a 9kg (19.84lb) sword. I could not see his reaction on the other side, but I am pretty sure Mr. Kane’s jaw dropped to the floor at first. Let it be clear – no one orders such things, historically there were almost never swords of that weight, and it is even difficult to believe it will be wieldable. I even doubted myself of that last part. Despite this, Mr. Kane, whose English in exceptionally fluent compared with most Chinese, was very professional about the matter and took my request seriously. From that point on, our communication, spanning over 70 emails (! ), was very good and friendly. 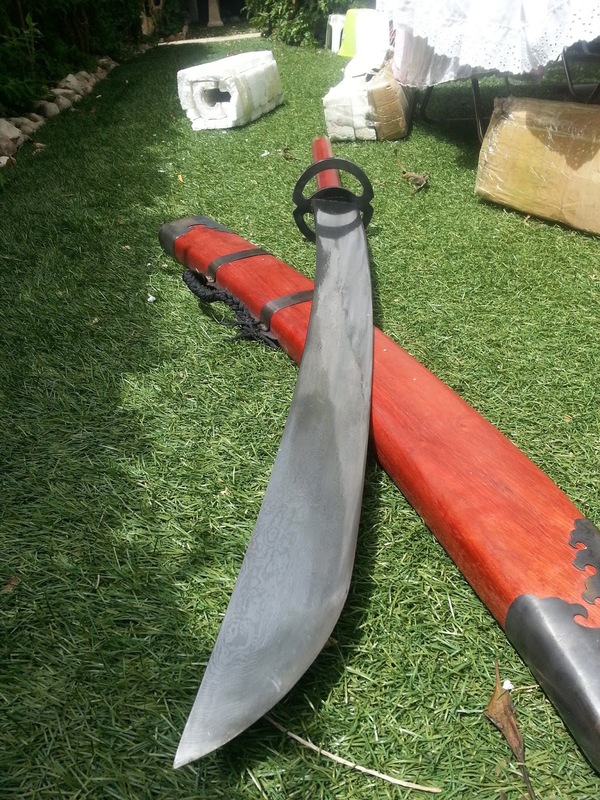 Mr. Kane initially believed that it will take their people 50 days to make the sword. It should be understood that with such a custom project, a group of artisans is involved. There is the blade maker, the polisher, the scabbard and handle carpenter, the bronze decorations person, the man or woman making the guard, and possibly a few other people. Therefore, the production is a layered and step-by-step process, and by no means an easy one. The original 50-day estimate made by Mr. Kane proved too optimistic. They do make most swords within 30-50 days’ time. But my project was something else. Because of the immense size of the blade, possibly the first one of its kind ever made, it was incredibly difficult to forge. The heat treatment in particular, which formed the final shape, was a delicate process. Their people had to throw away no less than 4 different blades, which came out bent or imperfect, until the fifth one came out alright. 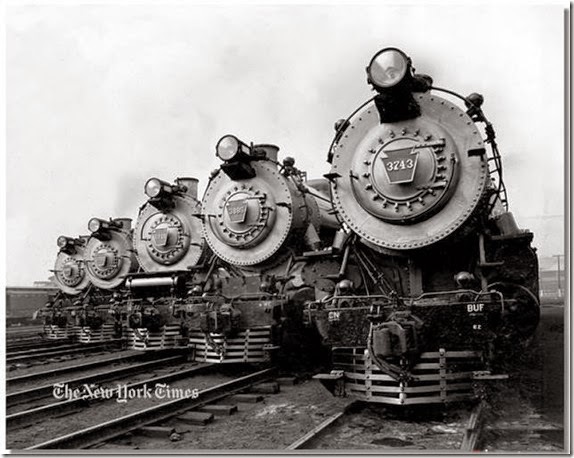 I know this for fact – I received images of those blades that were trashed later. That alone pushed the production time considerably. This did not mark the end of Mr. Kane’s headache. Over time, I made further customization requests that must have caused them lots of trouble. 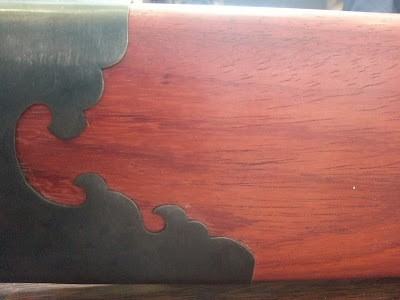 First, I wanted a special type of wood for the sword’s handle and scabbard. Sino-Sword do provide some 3-4 wood options, but I wanted to have something else. I did a week’s worth of research on wood types, and sent Mr. Kane a list of about 10 different woods, complete with their various names in Chinese characters. He went and checked around the area, but no one was selling these woods. Others, it turned out, were not fitting for swords, as their acidic nature rusts steel. 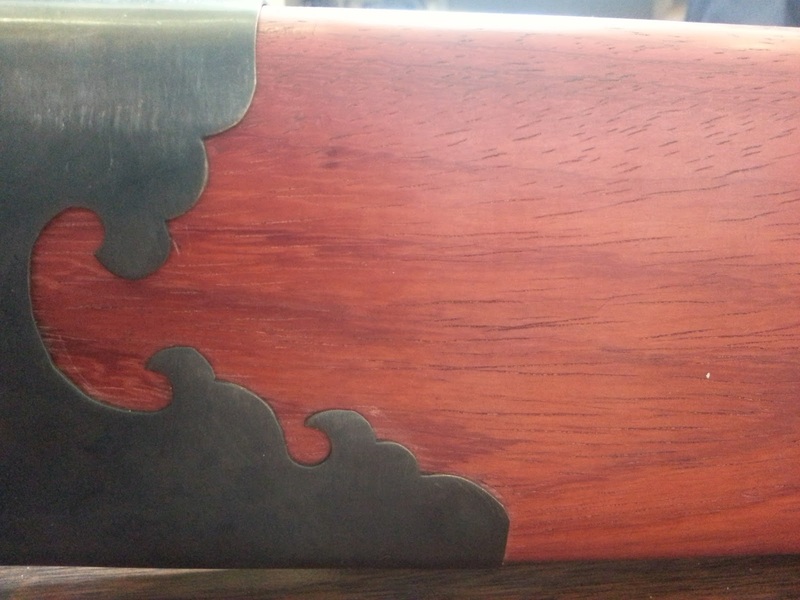 I then located a wood sellers on TaoBao.com (the Chinese mother-site of AliExpress.com), of which I chose one that sold what appeared to be high quality African Redwood (African Padauk) for a relatively cheap price. Mr. Kane agreed that I pay for the wood and shipping (inside China), and they will use that wood. This was lovely, as I do not think they have done this before. The level of customization that company will afford the customer is excellent, no doubt. The wood lingered the affair more because of its shipment, and the need to let it sit and dry for a while before working on it. Secondly, I asked that the guard will be made with a classic katana guard design, known as the ‘Musashi’. It is said that this design and another were created by legendary Japanese swordsman Miyamoto Musashi. Frankly, I only chose it because it was aesthetically pleasing. Yet because of the size of the blade, which Mr. Kane explained would have to be enlarged to make weight as demanded, the guard also needed to be bigger. Adding to that, I requested a guard made of heavy cast iron. I was right to believe that such a huge blade will unbalance the sword in a major way, and a heavy iron guard will help in counter-balancing. This was also partly why I chose the African Redwood, which is heavy, for the handle (and scabbard). When choosing woods, it is also important to remember that they change color over time, with exposure to sunlight. 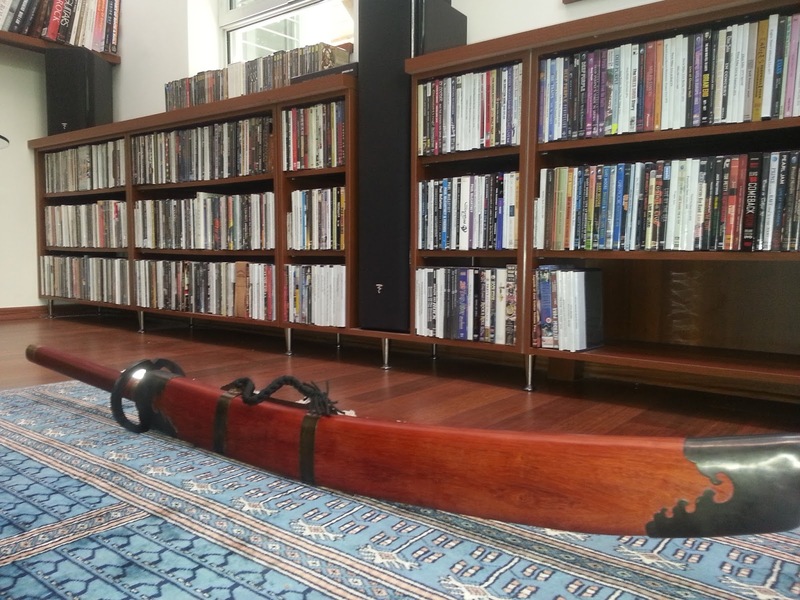 The Padauk was orange-red when it first arrived to Sino-Sword, changed into casual red and will over time likely become dark, ‘wine’ red, which I find beautiful and matching black brilliantly. Height: 7.8cm at the highest point. Width: 2.4cm at the thickest point (near the guard). Height: 138cm. Weight: 9kg (without the scabbard). 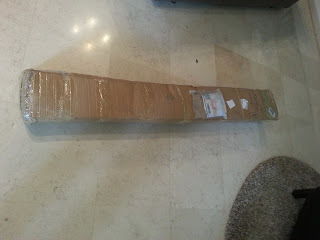 I believe I request a 135cm long sword, but the handle came out slightly longer. 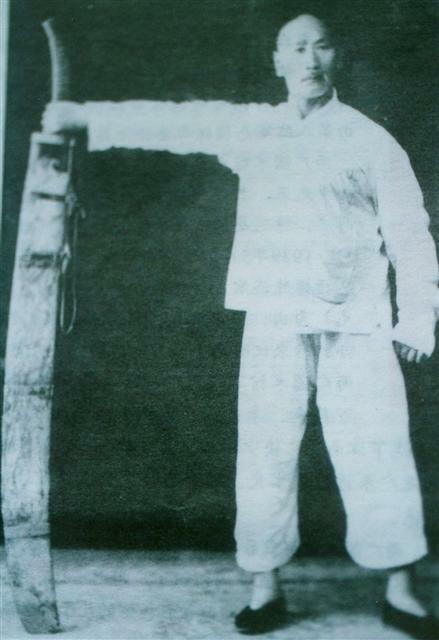 Miao Dao should match the height and arm length of the wielder. My small 170cm (5’7) frame works best with a 135cm sword. I did not request a fluffy katana rope (Sageo) to be attached to the scabbard, but it had been a great surprising addition to the design! To my surprise I can even comfortably carry the sword around by the scabbard holding the rope. No blood groove was carved into the blade, as it was not intended as a functional sword, but a strength training instrument. Less holes, more weight. Quite unintentionally, the design resulted in that the sword can easily and comfortably rest on its base on an even floor. The scabbard is wide and square enough to support it, and because the musashi guard has a V-shaped inward curve on the top and bottom, it also keeps the blade stable in this way. This is a very good by-product of the design, as the sword is too big to be placed on a traditional horizontal weapons rack. Back in the day in Japan, they traditionally folded the steel many times to remove impurities and refine the metal. Today this is not particularly necessary to have a good blade, especially if one does not intended to cut things with it, but I nonetheless opted for this option in production (just slightly more expensive) because it results in beautiful patterns on the blade. That, combined with a mirror finish, really do justice to this behemoth of metal. I did not request that the blade be sharpened, but it is still somewhat sharp just by design. I did however want to keep my options open. This is why I requested it be made of 1095 steel. Swords are usually in the grading of 1050 – 1095. This indicates the carbon amount in the blade – 0.50%-0.95%. More carbon means the blade is harder (makes it somewhat more brittle upon impact) and prone to rust when exposed to the elements, but can take a better edge and keep the edge after repeated abuse. Because the blade is so thick and massive I did not have to worry about ‘brittleness’. However, if you care to order a sword which is not meant to be used for cutting, it might be a better choice to go for something like 1050 steel. A piece of 1070 steel will provide a good compromise between cutting ability, flexibility and durability. The balance of the sword is off, compared to a regular miao dao, which is usually wonderfully balanced. It makes sense, given the size. Yet it is not as bad as I imagined it might be. In fact, the balance is still superior to that of my large spears. The weight is more of a challenge than the balance point, especially when the sword is accelerated through the air. Such a heavy weapon quickly reveals which of one’s muscles are the weak links in the chain – something which usually cannot be felt with a normal sword, unless one is frail to begin with. During my first training session, I managed to practice the basics (jiben gong), but could not manage past the 5 minute mark. However, I am certain that within a month of training or so I would be able to (barely) make it through the entire miao dao form I practice. The grip is more challenging as well. 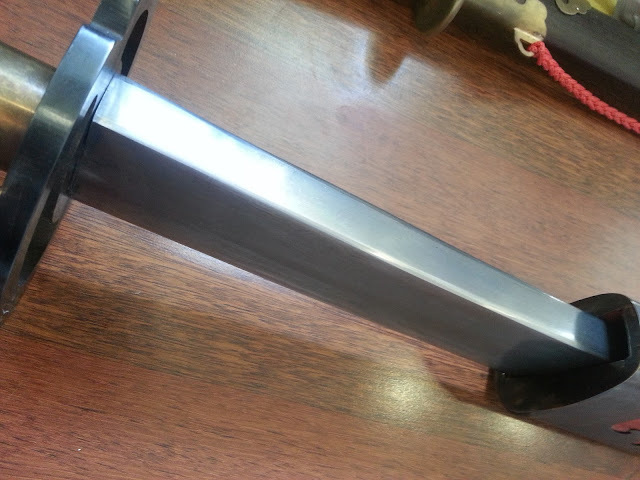 Because of the weight, Sino-Sword made the handle thicker than usual. Interestingly, what usually holds the handle inside the wood – two pieces of bamboo going through the metal, are missing from this new design. I suspect that the metal handle is fixed to the wood by screw or similar hidden within the pommel. Regardless, the handle of this high-quality custom work feels much more stable that that of the cheap training miao dao I have, which I bought for less than 100$ in China on my last visit in 2014. Here, the wood type also plays a role. Some woods are naturally more ‘stable’ than others, and African Padauk is a very stable specimen. It remains to be seen whether this thick wood handle would be able to contain and hold firmly in place the blade in the years to come. With my training miao dao, the metal is already rattling inside the handle. 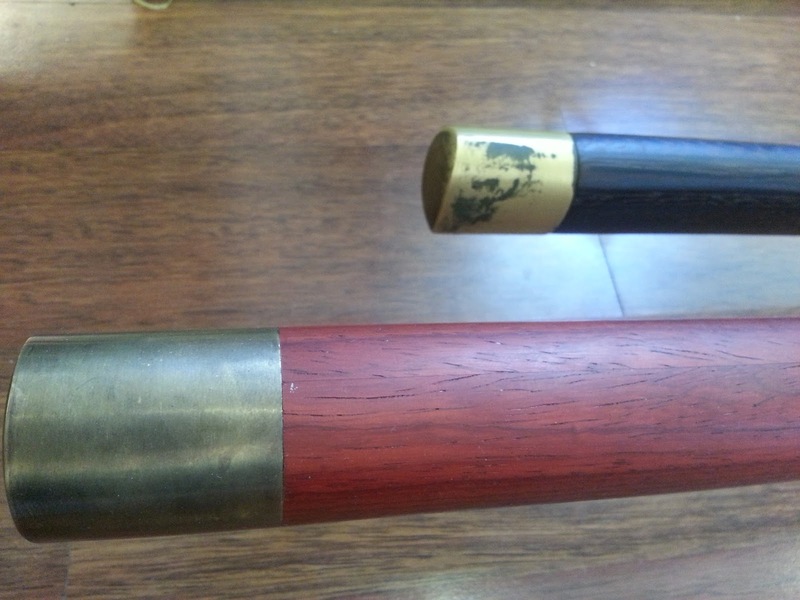 Likewise, the bronze fittings are expertly made and feel snug and tight around the wood, with no apparent movement, even under stress. For just 595$, I feel that this unique sword was a very good bargain. Though it had taken Sino-Sword 5 months to make, their patient and forthcoming customer service made time pass faster. Their willingness to compromise on many issues, some I have not mentioned, and trying to answer all of my demands, is greatly appreciated. They also made sure to send me pictures of the sword at each step of the way at my request, and change things based on my feedback. This is not a perfect sword. The blade had a few little scratches here and there. The bottom bronze fitting had a dent, which was likely caused by the rough people at the mail office (as Sino-Sword sent me pictures right prior to shipping they do not seem to have caused it themselves). It did end up taking quite a lot of time to make; and the blade rattles just a little bit within the scabbard. But overall, what can I say? One can hardly not fall in love with this piece of human engineering. The wood work is splendid. The blade is breathtaking. The colors do it justice; and the thing is just tons of fun to handle and play with. I would have never gotten such a fine sword made for that price anywhere else in the world, and as a matter of fact I was told by many smiths that this kind of thing simply “could not be made”. I am so glad Mr. Kane and his crew did not share that opinion. 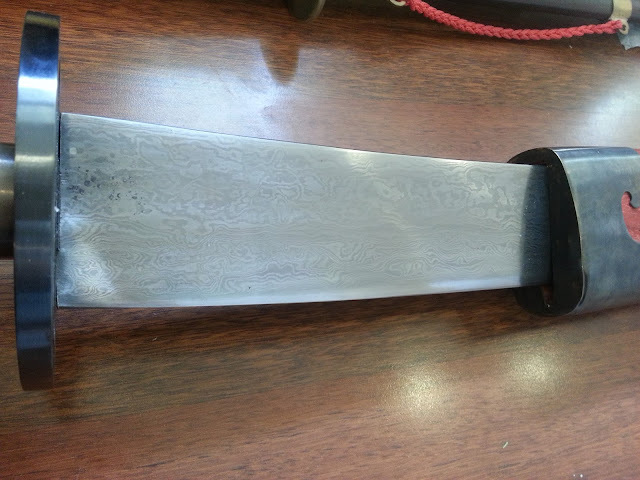 Therefore, I would like to recommend Sino-Sword to the rest of you as a custom sword forge – if only for their kind service and beautiful final product, even with those little faults mentioned. I have received what I have asked for, and I am overall very pleased with my purchase. Final costs: Sword – 595$. Shipping – 183$ (via EMS). African Redwood I requested they order – 60$ (after a 50$ discount for the wood not used). Customs tax (Israel) – 158$ . Total cost for the entire project: 996$ . For possibly the largest miao dao ever made, and certainly the only one of its kind in the world today. Mention Jonathan and you'll get a $10 discount on your order.